"The best newspaperman we've ever known." Pulitzer-prizewinning journalist Edward Cony ’48 died January 9, 2000, in Santa Cruz, California, from pneumonia and complications from Alzheimer’s disease. He was 66. Ed was born in Augusta, Maine, and attended Colby College for two years before serving in the U.S. Army in France, Luxembourg, and Germany. After WWII he came to Reed, where he majored in political science and wrote his thesis on the Fair Employment Practice Commission with Prof. Maure Goldschmidt ’30 [political science 1935–81]. After graduating from Reed, he earned a master's degree in journalism from Stanford University, worked as a reporter for the Oregonian, and then joined the Wall Street Journal, working first as a reporter in the San Francisco bureau and later serving as a bureau chief in Los Angeles and Jacksonville, Florida. In addition to covering business and markets, he also wrote many articles about school integration in the South. He was also on the scene in Cuba when communist forces under Fidel Castro overthrew the Batista regime. In June 1960, Ed noticed a brief story in the Journal about a routine timber sale. There was something about the sale that didn't seem quite right; he decided to dig deeper. Eventually he discovered that several executives of the Georgia-Pacific Corporation were involved in personal dealings with their own business—a practice that was then widespread. Ed won the Pulitzer Prize in 1961 for his articles on the transaction. The prize committee praised his work for drawing public attention to the problems of business ethics. In 1965, Ed was named managing editor of the Journal, the newspaper’s highest ranking news position. In 1968, he hired the paper's first black newsroom staffers and pushed for more diversity in the newsroom throughout his career. He continued to climb the ranks at the Journal and its parent company, Dow Jones, serving as executive director, vice president, president of the Dow Jones division that published the Asian Wall Street Journal, and eventually the illustrious title of editor of the Journal. Ed was elected president of the American Society of Newspaper Editors in 1988. Before he could take office, however, he was diagnosed with Alzheimer's disease; reluctantly he told the society's board that he could not serve. The board went ahead and appointed him president anyway, and reluctantly accepted his resignation a few hours later. Cony served as a trustee from 1974 to 1990 and maintained strong ties with Reed. 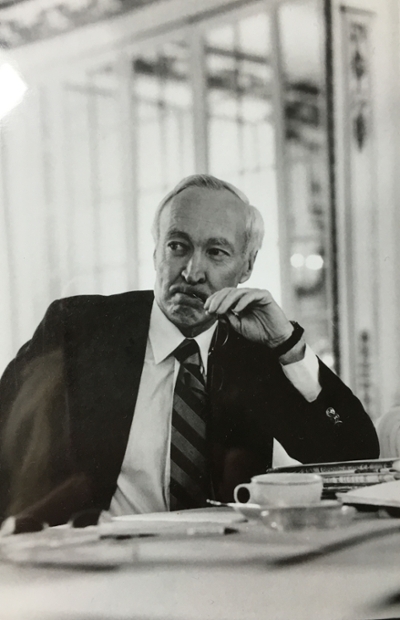 He was deeply involved in defending the First Amendment and was a frequent speaker (sometimes at Reed) on the topic of rights and responsibilities of the media. Survivors include his wife, Sue; a son; five daughters; a sister; and 10 grandchildren.